After 3 years and 3 months of construction my first flight took place 8/8/07 and lasted 1.4 hrs. I structured my first flight as I have several others where I served as an EAA Flight Advisor. (my thoughts on first flights can be found in an article I wrote) The upshot is that I really believe the pilot needs to shed some workload during this intense period for better decision making, data collection, and assistance with any unforseen circumstances. So I arranged for builder buddy Randy Griffin to act as mission coordinator in the back seat of Dan Miller's RV-8. All aspects of the first flight were thoroughly planned and briefed. The airport where I hangar, KVUO, is not a good setting for first flight with it sitting in a cutout of Portland's class C airspace, and few good options in the vicinity for landing out other than a parallel hiway and the Columbia River. I made the best of it though essentially repeating the process I used when making the first flight in my RV-8. With the chase plane and mission coordinator ready in the run-up area with me, I launched into the pattern and planned to make one or two circuits to make sure the engine would stay running and all flight controls worked properly. 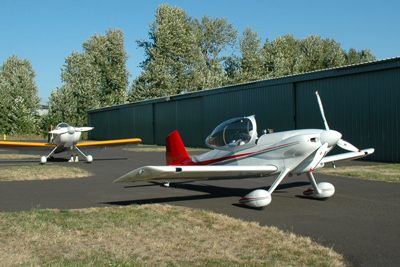 Then, unable to circle up due to the PDX Class C, I departed to the NW for open skis over Scappoose (KSPB). After one circuit everthing was working fine so I gave the signal on the radio for the chase plane to launch and we were off. The items on my short test list all checked out ok, and all temps were remaining in the green so we continued to run up and down the Columbia River at around 6,000'. After about 45 minutes of full power I slowed down and collected stall data so my mission could compute my 1.4 x Vso approach speed and read it back to me. Back up to full power for a few minutes to let the chase plane get in and land and I headed back to the airport. I flew the 82 mph approach speed my mission coordinator gave me and took my time setting it down since I wasn't tuned into the proper sight picture for landing yet. It landed just quite nicely! All told I was definitely less anxious and more matter-of-fact about this first flight than my last one, I guess that's the effect of experience. Pretty typical issues really, and each of them has subsequently been addressed and resolved. Of course with a new engine break-in always needs to be considered, here are my thoughts and what I've learned on that issue. See below for performance numbers some impressions of how it flies. Control feel — My initial impression was that it felt heavier on the controls than an RV-8, not lighter and more nimble as you might expect. Then I realized that since I was running the engine hard for break-in and flying at high airspeeds, and that that was likely the cause. After more time, and the chance to fly a little slower, it find it feels more like other RVs. There are some differences however, see subsequent comments. Takeoff & landing distances — While it behaves just like an RV, I do notice that both my takeoff and landing distances are shorter. This is kind of nice, I can make taxiways I couldn't necessarly make in the RV-8 without a concerted effort. Climb — I didn't expect this plane to be any faster than any other RV, the laws of physics and aerodynamics dictate that it would be within a certain range. I suspected it would climb well due to the light weight though and wow, it really does. Intitial observations showed I still was climing at 1,800 fpm at 6,000' msl. Speed — I haven't completed all my testing yet but as of this writing I have collected good data on my 75% cruise... 213 mph TAS at 8,000'. That was a bit better than I was expecting. Looks like my O-360 buddies won't be waiting for me which was one of my goals for the plane. C.G. — As originally configured I found the plane to be a bit too nose heavy. 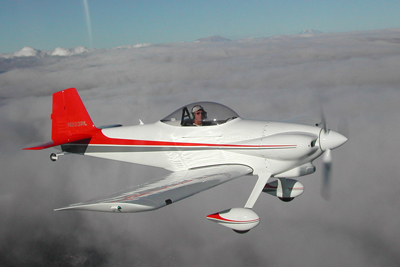 This really reminded my of flying an RV-8 solo with a Hartzell on the nose and the battery fwd. Moving the CG aft on both planes really makes them much sweeter handling in all modes. Further comments and data are below in the Optimizing CG section. 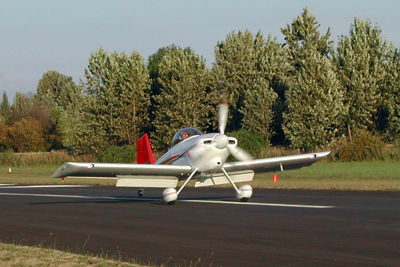 Trim speed — One thing I noticed on my first landing is that I can't trim to approach speed. In the original nose-heavy configuration it won't trim to anything below 95 mph. This of course was one of the clues to a fwd CG condition. With the 25 lbs of lead in the back it behaves better, and pitch forces are lighter on approach, but I still need to hold back stick all the way to landing. My trim tab is getting 20° of deflection, I'll try to change the range to provide a few more degrees. Comfort — Of course I designed the cockpit ergos specifically for me, but it is really comfortable. When done flying I sometimes just sit there and don't want to get out. As far as I'm concerned Oregon Aero seats really are worth it. I'm flying now with the battery relocated aft of the seat. My spreadsheet tells me this shifted the empty CG from 57.08" to 58.05" (will verify by re-weighing the plane soon), which doesn't sound like much. Still, it makes a noticeable difference and the plane feels much better now in all modes and just lighter altogether. This CG location also still leaves ample baggage capacity so I'm happy and consider the CG optimized. Landings — Until last night I could land the plane but not with any finese, and I tended to always bounce it once, then settle it down. Last night I specifically worked on landings by doing 10 touch-and-goes in a row and really concentrating on it. I can now wheel land it smoothly which makes me feel better. Some other day I'll work on getting 3-pointers down. Overall — The enjoyment factor is going up, the plane feels lighter and handles better now, and the bugs are getting worked out, very few remaining. It really is just like a fine handling sports car capable of great finese, I just need to catch up to the capabilities of the plane! As I continue to get in tune with the -3 I'm realizing it really does have some unique qualities and is indeed different from the other RV models. You really do wear this plane. It is capable great finese that you don't realize until you get more in tune with it. I've been doing quite a bit of formation flying lately with my local group — when you fly in close proximity to another aircraft and are making constant control inputs you really get in touch with the feel quickly. While any RV is indeed very responsive compared to a common certified ship, the RV-3 takes responsiveness to a whole new level. You think and it's there. If you fly by moving your whole arm you will over-control the plane and miss the point altogether. Fingertip pressure and small movements are all that is required for most maneuvers, just relax and make small pressure adjustments. That there's simply less mass there is I'm sure part of the equation. After acclimating to it you feel like you can maneuver inside even another RV. The 747-like patterns that Cessnas fly in the pattern are becoming increasingly annoying. With the flexibility afforded by a constant speed prop I can fly a tight downwind at 125 mph, pull power, trim up, dump the flaps, and fly a rounded turn to base and final and land in a very small amount of geography. Landings are continuing to improve, I even did my first formation landing the other day, no problem. The trick is again to be subtle and get in touch with the plane. If you do so it will reward you with instant responsiveness and make you look good. Doing a wheel landing and then keeping the tail up is easy. With just a bit of power and forward stick and the flaps down you can drive it down the runway with the tail up at will. I would estimate I can get down to about 25-30 mph until I must let the tail come down. Heck, it almost feels like I could steer it onto the taxiway with the tail up — with some brakes and a bit more throttle I might be able to. Then there's the performance. As mentioned above, the climb is spectacular, and I really do need to get some hard data on this. As lead ship doing section formation takeoffs I need to use what feels like 2/3 power even with an O-360/Hartzell/solo RV-4/6/7/8 beside me. If it has a fixed pitch prop, regardless of engine, I'm only using about 17" of MAP for the entire takeoff which feels like about half power. Needless to say, I'm a happy camper! Can't wait to finish my Phase I work and start on some cross country. Performance — The climb performance of this plane is the most notable overall feature and one of two areas where it really stands out from the rest of the RV family (the other being just the responsiveness or finese it is capable of). I still don't have hard numbers on climb but I've just listed >2,500 fpm in my POH. As you get up to the cruise altitudes, 6-9,000', it will still climb at nearly 2,000 fpm. Preliminary testing shows Vy at about 125 mph. I had a climb contest with a buddy the other day. 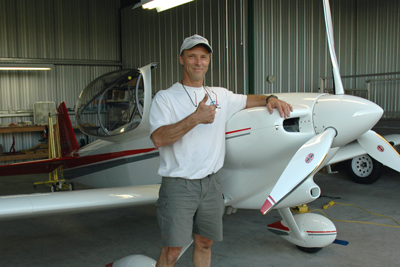 He has an RV-4 with an IO-360 200 hp angle valve and was solo. We pulled up next to each other, held 140 mph indicated and went full forward on throttle and prop. I climbed away from him smartly. It simply goes up like an elevator! Landings — As mentioned earlier, wheel landings are my normal landing mode. 3-pointers can be tricky, and airspeed control is essential with them. I use 82 mph as my regular approach speed which is 1.4 Vso and it works well. Any faster and a 3-pointer will get squirrelly as you have too much energy and end up making several landings. Any slower and it will drop in pretty quickly with tailwheel first. Wheel landings are more tolerant of speed variations though this plane still has a fairly narrow speed envelope it likes to land at. For short field work I shoot for just under 78-79 mph and drag it in with some power, then 3-point it. Normally though, wheel landings just seem to work best for me. Stalls & spins — Through several rounds of testing I've determined that there is a 2 mph IAS difference in stall speeds from solo/light configuration to gross weight, both with flaps and without. Stalls are conventional but it almost always drops one wing or the other, usually the right wing no matter how centered I keep the ball. Spins are conventional, you have to really hold the stick back and use full rudder to get to to fully spin though. If you don't it will drop the nose in the direction of the rudder and spiral. Keep the rudder in and stick back hard and you can feel the inside wing truly stop flying and enter a true spin. And once you do enter a spin conventional control inputs (opposite rudder, center the stick) work just as you'd expect with recovery taking about a half turn. Cross country — The longest trip I've done so far was 2.2 hrs each way. No problems, just program the waypoints into the GPS, engage the autopilot, get it leaned out, and enjoy the ride. This is a small aircraft however and in spite of the cockpit storage I've built in there just isn't a lot of room for frills. Folding sectionals and looking for a place to stash them while you do something else is challenging. I'm trying to learn to rely on the electronics more since the Garmin 496 really has all the data you need in it, but I can wean myself fully from the paper pilot aids (sectionals, WACs, and Flight Guide). Am I just being old fashioned here, should I dump the paper stuff? And there's no way you're going to take your lunch and cold drinks in a small cooler like you can in a side-by-side RV. An energy bar and a bottle of water can be stuffed down beside the seat or in the area forward of the spar though. Still, that's the tradeoff you make with any sports car, right? With fuel prices being what they are I tend to use 55-65% cruise power settings which when running LOP result in a fuel burn of around 6.3 gph and 175-180 mph TAS. Bottom line — Overall I couldn't be happier with the plane. It is everything I had hoped it would be and then some. As mentioned in the About the project page, I like small efficient machines and this plane certainly fills that bill. It's really nice to be able to move the plane around so easily without any help. Even when cleaning the exterior there's a benefit, there's just less area to clean. Indeed less can be more! Performance numbers measured and compared with those posted by Van's Aircraft in the table below. • 75% cruise done at 8,000' pressure altitude with a known accurate OAT and ASI corroborated with GPS groundspeed. • Stall speed tested with full fuel and low fuel, no difference noted. Weight & balance data for my aircraft is listed below. It was weighed 7/4/07 using calibrated digital race car scales. Each pad was verified first with a known weight. I can't explain why the plane gained 11 lbs when I re-weighed it. The tires weighed about 3 lbs more each which is 6 of the 11, where did the rest of the weight come from? • Note that with all the computer designed RV models you really don't need to verify the wheel station locations when doing your W&B computations, but you DO need to with the older planes such as the RV-3. In fact my wheels deviated from the station specified in the plans by .38" on the main wheels and .6" on the tailwheel. Those sound like small numbers but they do change the CG calculation so make sure you measure your plane accurately. With longerons level, plumb down from the wing leading edge, then plumb from the center point of the wheel axles. Measure the distance between these points and add 50" to get the correct station from the datum. • Use accurate scales, bathroom scales will NOT suffice. Our EAA chapter owns a set of race car scales that we have calibrated occasionally, find something similar. Many FBOs have a set of scales that you can borrow or rent. • There has been some confusion regarding the correct weight & balance specs for the RV-3 (all versions). See the RV-3 Info section for further reference info and explanation. If you take the estimated 42 lbs away from the 878 you get 836 lbs which is more what I was targeting. I think this plane, and the above incremental items, is proof that "it all adds up". I set my gross weight at 1,300 lbs which is really needed to have any sort of practical loading capability. The good news is that being only 170 lbs I can still make the aerobatic gross weight without a problem. Over time I will likely make some effort to reduce weight. For example as great as the HID lights are I may go back to the standard (and light!) Duckworks H3 bulb version, then I can also wig-wag them. In building an RV-3 you really don't have too many options available in controlling the aircraft CG, mainly just the battery. I originally located the battery just forward of the main wing spar so as to preserve as much baggage compartment weight capacity as possible. Also, Van told me "you really don't want to operate an RV-3 near the aft end of the CG envelope". Both of these factors led me to locate the battery forward of the wing, though back as close to the wing as possible. As originally configured my empty CG came out at 57.08". If you compare that to all the RV-3s listed in the registry you'll see it's more aft than some and more forward than others. After flying the plane though I thought it felt nose heavy, especially on approach and landing. On checking my W&B spreadsheet, sure enough, with me and normal fuel I am 20-26% of the way back in the CG range depending on fuel load. My spreadsheet tells me I could put over 60 lbs of baggage back there and still be an inch forward of the aft CG limit. To see what effect moving the CG aft would have I put a 25 lb shot bag at the very aft end of the baggage compartment and did some test flying. Voila, a much better handling airplane, and my spreadsheet tells me I still have adequate baggage capacity. Conclusion: my CG is too far forward and thus I moved my battery back behind the seat (pic here). New W&B data is indicated above after I re-weighed the plane. DISCLAIMER: Information contained on this page pertains ONLY to one specific aircraft: N223RL. Information is presented for informational and comparative purposes only, author assumes no responsibility for use of this information for any other aircraft. The manufacturer (builder) of any Experimental Amateur-Built aircraft is responsible for creating a P.O.H. including all performance data based on testing of that specific aircraft. • Flying with AOA - Angle-of-attack (AOA) instrumentation is something every builder of an experimental aircraft should consider, the benefits are considerable. This link is an article for the RVator which has my thoughts and experience. As the builder of an RV, or any Experimental Amateur Built (EAB) aircraft, you are the manufacter, not Van's or whomever made the kit. When you are granted your Airworthiness certificate you are also required to complete a Phase 1 test period where you fully test all the operating parameters of the aircraft. The data gained from this testing should be compiled into a Pilot's Operating Handbook (POH) for the specific aircraft. Peak EGT:	Stoichometric combustion, maximum combustion chamber pressures, avoid when over 75% power. Best power:	100° ROP, fastest flame front, note that this may not be full rich. Pilots always like to compare notes on oil consumption, and it is indeed an important parameter to keep track of and watch for any changes. My oil consumption trend seems to be about a quart in 20-25 Hobbs hours. Regarding oil, I'm a multiviscosity fan and use Exxon Elite. Further thoughts on the Maintenance page. Lauran Paine get's the idea, here's a quote from one of his magazine articles. A formation flown according to FFI standards in Chino, May 2008. Can you pick out which one is me? I discovered formation flying back in 2001 with my RV-8. Since then I've really grown to like it, in fact it's my favorite flying activity now and was one of the things I had in mind while building my RV-3B. As with many aviation activities however the risks are obvious and the only safe way to get into it is with proper training. Formation flying is not to be confused with a "gaggle" which is actually dangerous. Any formation flight should be thoroughly briefed and flown according to an approved set of standards. Each pilot in the flight should have previously demonstrated proficiency in all maneuvers and knowledge of all procedures, enter FFI. In order to provide a "Standards and Proficiency Program" to various factions of the GA community, FFI was formed in 1997. See the FFI Manual link below for more info. I have attended several FFI-conforming clinics now and earned my FFI Wingman card. If you have an interest in formation flying t he best way to start is by getting a copy of the T-34 Association's Formation Flying Manual, also known as "thuh book", and the "RV Supplement" which proveds RV-specific procedures. Also valuable is Formation Flying, The Art video. These materials have come to define the "standard" for formation flight for both warbird and homebuilt groups. If you're still up for it then the best way to get started is attend one of the clinics that get put on in various parts of the country each year.